In every country and community worldwide, pregnancy and childbirth are momentous events in the lives of women and families and represent a time of intense vulnerability. As part of an overall effort to promote respectful maternity care, the Health Policy Project and White Ribbon Alliance have launched the Respectful Maternity Care Charter, based on the principle that respectful maternity care is every woman's right. 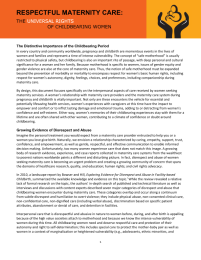 A broad group of stakeholders representing research, clinical, human rights, and advocacy perspectives came together in a community of concern to develop this charter, which addresses the issue of disrespect and abuse among women seeking maternity care and provides a platform for improvement through seven distinct articles that clarify the rights of childbearing women. Improving the quality of care for women is an essential component in our work to improve maternal health worldwide. This charter is accompanied by a summary brochure and poster and is supported by A Guide for Advocating for Respectful Maternity Care, which provides national-level advocates with information, tools, and techniques to (1) raise awareness and demand for respectful maternity care (RMC), (2) hold local leaders and service providers accountable, and (3) secure commitments to institutionalize RMC as the standard of care. Tags: Click to view other publications with selected tag.